Melanie was once hailed as the "female Bob Dylan." I think that comparison is actually very accurate. Her music clearly has the same kind of resonance as Dylan's. It also has the bit of a DIY "rough around the edges" vibe that Dylan showcased. They should certainly appeal to the same kind of music fans. 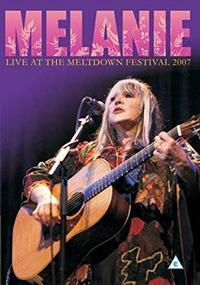 This new DVD captures a festival appearance from 2007, but there is much more than that here. There is some video from her Glastonbury festival all the way back in 1971, for instance. There is sound-check material and other behind the scenes stuff. It's all shot very professionally, and the sound quality is solid. If you are fan of Melanie, you should own this. If you haven't heard her before, but are a big fan of Dylan, you should give this a try. It's a great way to sample a legendary artist. This review is available in book format (hardcover and paperback) in Music Street Journal: 2018 Volume 6 at lulu.com/strangesound.